This Thursday, Oct. 18, at 10:18 a.m., nearly a million school kids will presumably dive under tables and desks to "drop, cover and hold on" in the annual Great Shakeout, the annual statewide earthquake drill. Traditionally, the presumption has been that this is what you do once the shaking starts — but efforts are accelerating to get warnings to people before the shaking starts, even if it's with just a few seconds to spare. After years of sluggish progress in California, there are signs that things are finally shakin' on the quake warning front. Recently state, federal, and local officials — and scientists — crowded onto a Bay Area Rapid Transit rail car to officially roll out the latest phase of ShakeAlert, the statewide system designed to provide seconds of warning before the shaking of an earthquake arrives. BART has been using ShakeAlert in an early pilot phase for about six years, to trigger a system-wide slowdown of trains at the first sign of an earthquake. But now the "early warning" system behind BART's automatic slowdowns is available for any organization to try out, for its own purposes. "It's now ready for prime time," says Richard Allen, who heads the Berkeley Seismology Lab and has been a key player in developing ShakeAlert. Allen says it's "safe to say" that the core system — meaning the algorithms that translate signals from the state's network of seismic sensors into instant warnings — are the world's most advanced. Where California and the rest of the U.S. lag other countries like Mexico and Japan, he says, is in getting the word out to the broadest possible audience. What is billed as "ShakeAlert 2.0" is intended to help bridge that gap. "This is a game changer, says State Senator Jerry Hill (D-San Mateo), "and a lifesaver." "And that’s what I think people don’t realize," Hill went on, "that if you can predict when that shaking will start, and what we can do with that knowledge." With as little a few seconds warning, hospitals can halt surgeries and other delicate procedures, firehouse doors can open automatically, industrial process lines can stop, and school kids can "duck, cover, and hold on." While BART was an unusually early adopter and claims bragging rights to being the nation's first transit system with quake warning, about 50 more ShakeAlert pilot projects are launching with the new version. They range from schools to hospitals to the people who operate local water supply infrastructure. Early this month, Interior Secretary Ryan Zinke issued an order fast-tracking the installation of more in-ground seismic sensors on federal lands, including national parks up and down the West Coast. Allen says that permitting has been "a real issue" in getting the network built out and called the order "great news." Currently the California Integrated Seismic Network, eventually numbering more than 1,100 sensors, is only about half complete, with most sensors clustered around major population centers such as Los Angeles and the Bay Area. According to The Wall Street Journal, which obtained the order, Zinke "gave directors of agencies including the Bureau of Land Management, National Park Service and U.S. Fish and Wildlife Service 30 days to identify and help remove regulatory impediments to putting in the alert sensors." But building the system is one thing, keeping it going is another. And lack of funding has been a drag on the effort. In fact, the original legislation authorizing the network in California included no funding at all. Recently, however, the state budgeted $15 million to finish the buildout in California, hoped to be fully operational by 2021. "I think the money will be there," says Hill. Private interests, notably the Gordon and Betty Moore Foundation, have kicked in large sums to speed the effort. "It’s a public-private partnership that I believe will be able to fund most of it as we go forward," says Hill. Federal money will be needed as well, to get to the $16 million dollars a year it will take to maintain the system in California. Congressman Adam Schiff (D-Pasadena) says that so far, the effort has had rare bipartisan support in Congress. 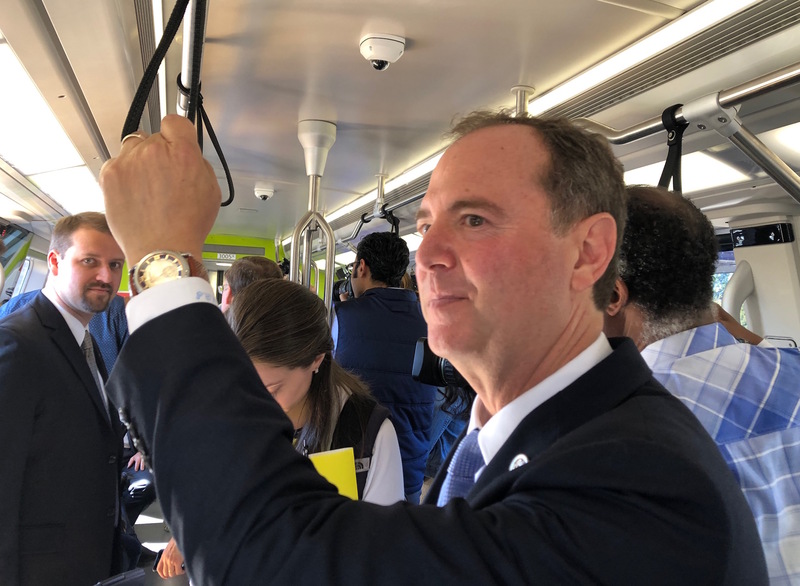 "This will undoubtedly save lives and save untold billions of dollars in property damage," says Schiff, "so it will pay for itself in many ways and it would be penny-wise and pound-foolish not to follow through." At the same time, private-sector developers are racing to get their own systems jump-started. 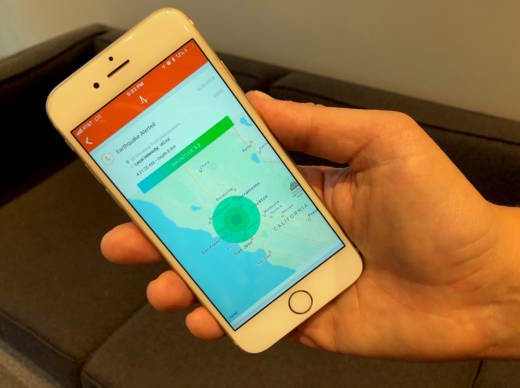 Berkeley-based SkyAlert USA is rolling out a version that taps the ShakeAlert system for data, then sends out warnings via its smartphone app. "I think this will really make a difference," says SkyAlert CEO Alejandro Cantu, who imported the idea from Mexico, which already has a public alert system in place. "We saw how this technology actually spread like a virus in Mexico and now everybody owns it," notes Cantu. "This is exactly what we are going to be seeing in the U.S."
Cantu says the system was literally a lifesaver during the magnitude 7.1 earthquake that rocked Mexico City just over a year ago. "We received all these nice messages from users saying, 'I received the warning, I got out of the building' that literally collapsed behind them, saving their lives." Allen's team at UC Berkeley is also developing a phone-based system called MyShake. But unlike SkyAlert, which relies on the network of ground-based sensors, MyShake uses the built-in accelerometers in thousands of smartphones to detect a quake's initial vibrations and turn them into speed-of-light warnings. While Cantu predicts that his app will be consumer-ready first, neither he nor Allen consider it a competition. "We're all really in it together," says Cantu, "as we all get in a way to compete but also at the same time collaborate...it's like we're pushing everyone to be better." All of this leaves dangling the question of why California and the U.S. have lagged behind other quake-prone countries in rolling out a comprehensive quake warning system. The answer could be darkly simple. "Because we haven't killed thousands of people in one earthquake yet," says Lucy Jones, a Caltech seismologist and founder of the eponymous Center for Science and Society in Burbank. Jones recalls that Japan funded its system, after 5,000 people died in the 2005 Kobe earthquake. Likewise Mexico and China got serious about their warning systems after major quakes produced death tolls in the tens of thousands. "It's absolutely money and political will to do it," says Jones. "And if you haven't killed a lot of people in an earthquake, it's hard to get the political will." "Other countries have implemented a system like this and we are actually lagging behind," says Schiff, "and as prone as we are to earthquakes, that’s a very dangerous position to be in."